Nestled outside a small town called Happy Camp in northern California is a wonderland of wilderness. When Larry and I leave our home in upstate New York for our yearly vacation, this is where we always go. We both have professional careers in New York; the type of work which includes lots of politics and stress. Larry isn’t the type of person who can sit around and relax. He has to be involved in a physical activity to find some balance. Dredging for gold provides an exciting and demanding diversion from normal everyday life. Larry enjoys the challenge of simply having to strategically move rocks and boulders out of the way on the intuition that mother nature’s golden treasure might be located underneath. I have to admit that I enjoy the activity, too. 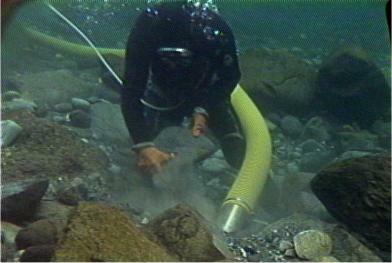 While I haven’t started diving yet, I make myself useful by operating the winch and helping with the gold cleanup. Back in 1985, Larry was introduced to gold mining by a friend. 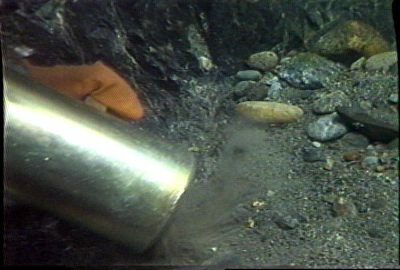 The first time he saw gold in the sluice box of a gold dredge, he was hooked. Gold Fever–he has it and there is no cure! 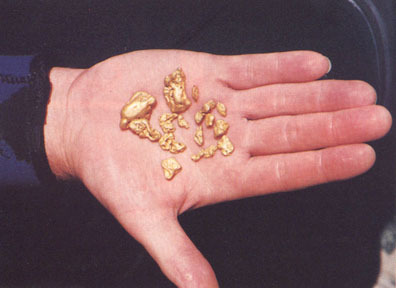 Larry’s most memorable gold mining trip was when he found his first pocket of nuggets in a hidden crack in the bedrock, up on Indian Creek near Happy Camp. He had been mining along and not finding very much when he decided to break open that crack. It was loaded! From then on, every crack has been opened up. Larry’s sister, brother-in-law and eight-year-old niece made the trip to California to join us in Happy Camp several seasons ago. 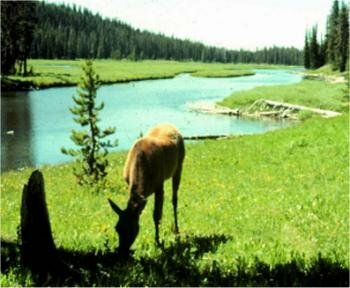 We introduced them to gold prospecting and re-introduced Sharon to camping, which she always enjoyed as a kid. Perhaps because of the friendly quiet time around the evening campfire, it was amazing to watch the family relationship become rejuvenated. Larry gave his niece a nice locket containing some of the gold he was finding and it was an experience she will probably remember for the rest of her life! As long as we stay able, we will continue to dredge for gold. We started with a 2 1/2 inch dredge and have graduated to a 5-incher. 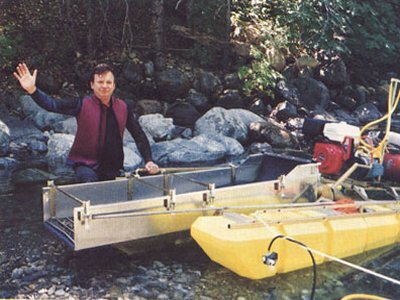 Over the years, Larry has bought a lot of equipment in his search for gold. We have not gotten financially rich from the gold we have found, but we have found some awfully-nice gold; we have had many emotionally-enriching experiences; we have had great vacations, and met wonderful people through the New 49’er Prospecting Organization in Happy Camp. The interesting thing about gold prospecting, is that when you are following a pay-streak, you never know what you might find. The possibility of “striking it rich” is always right there, That’s one of the things that makes the activity so exciting. Every summer, The New 49’ers sponsors kinds of interesting activity, including metal detecting hunts, white-water rafting and hiking trips, slide presentations of Dave McCracken’s gold mining adventures from around the world, organized group mining and training projects, and weekly potlucks with wonderful food and the fellowship of many other interesting people on the quest for gold and adventure. 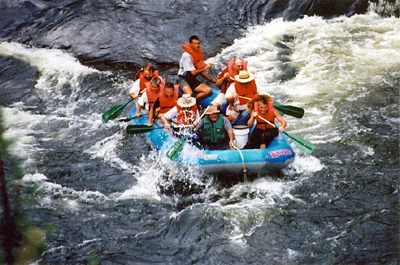 Besides the more serious activity of prospecting, there is a lot of other outdoor fun for the whole family. This year’s vacation started out the same as previous years for Larry and me. We spent the first day setting up camp and getting the dredge into the water. We found a really excellent spot several years ago and have been returning to the same location each year, but the pay-streak we have been working (for years) was almost finished. We knew this because the gold was getting spotty. Sometimes it was rich with big nuggets, and sometimes it was poor. We worked all the first week to find no gold that we would be able take and show off at the Saturday night potluck dinner. Showing off our nuggets on Saturday night has always been a highlight! A lot of 49’er members bring their gold-finds to the weekly potlucks. Week two started out to be the same, and we thought that we would be returning to New York with no gold this year. On day three, after 45 minutes of dredging, Larry came out of the water. The look on his face was one of disappointment. He said I could look in the sluice box, but there wouldn’t be anything in it. He was right, because he was holding a beautiful 3/4 ounce nugget in his glove where I couldn’t see it. He was not disappointed–he just wanted to see the look on my face when he dropped it into the sluice box. The sight of that big hunk of gold in the sluice box just made my day–my vacation, for that matter. here’s a lot more to a gold mining adventure than the gold you get. There’s the beautiful outdoors, the clear nights with bright stars, the great camping and campfire-meetings with new-found friends. There’s nothing better than fresh-cooked trout that you just caught out of the creek. But, I have to say that finding Mother Nature’s hidden gold deposits is sweeter than frosting on the cake! I had to go home at the end of that week. Larry had another week of vacation, so was able to stay longer. When he came home, he had a little over 2 1/2 ounces of gold. This was one of the best gold-finding vacations we have had. You take what you can get while you are searching for the mother lode! Sometimes its pretty good! All the money in the world couldn’t buy a better vacation for Larry and I! It is now winter and cold and snowing here in New York. Our thoughts are of our next vacation–hoping we will find bigger and better gold.